‘Only two for Everest’ 1951. A friend’s father, Ed Cotter, has had a biographical book ‘Only two for Everest’ by author Lyn McKinnon (pictured above) published. This post contains galleries of the book launch event at the Sumner Surf Life Saving Club last Thursday night, 6 October 2016. 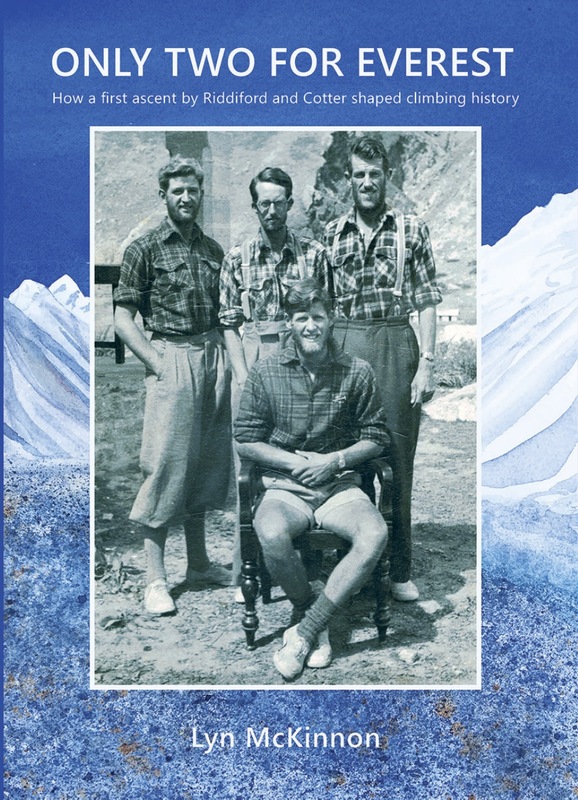 The book tells the untold story of Ed Cotter’s mountaineering career in the 1950s. It describes how a Kiwi expedition to the Himalaya, culminating in a first ascent of Mukut Parbat in NW India by Riddiford and Cotter, shaped climbing history. Friend Jacqui Cotter is an accomplished watercolour artist who specialises in works with an alpine theme. Otago University Press commissioned Jacqui to illustrate the cover that graces her father’s biography. Ed Cotter is seated, Ed Hillary is standing to his right, Riddiford & Lowe are to his left. To learn the significance behind the fact Ed is seated in the chair reserved for the Mukut Parbat leader you’ll need to read the book. This is the long-awaited, untold story of the 1951 New Zealand Garhwal Expedition to Mukut Parbat in NW India with Earle Riddiford (leader), Ed Hillary, George Lowe & Ed Cotter. Only Two for Everest is a ripping yarn—a full biography of Riddiford and ‘the other Ed’ Cotter. You find out why it is ‘the other Ed’ who is sitting on the chair reserved for the Mukut Parbat leader on the book cover. Book launch events were held in various centres including Wellington October 5 and in Christchurch at the Sumner Surf Club October 6, in association with Otago University Press and the New Zealand Alpine Club. My brief was to document the event shooting HD video of the speeches and stills. The very large crowd that turned up to mark the occasion and honour unsung heroes George Lowe, Ed Cotter and Earle Riddiford included members of the families of these men and a solid showing of their contemporaries and friends. The first gallery are the images in colour, the second, the same images in black and white. Prints of Jacqui’s cover artwork are available via her Facebook Page. The book, Only Two for Everest, is available from Scorpio Books’ online store. The forbidding peak of Mukut Parbat, alt 7,242m (23,750 ft). North East of Badrinath on the Indo-China border. This formidable peak was first climbed in 1951 by Ed Cotter, Ed Hillary, George Lowe and Earle Riddiford. 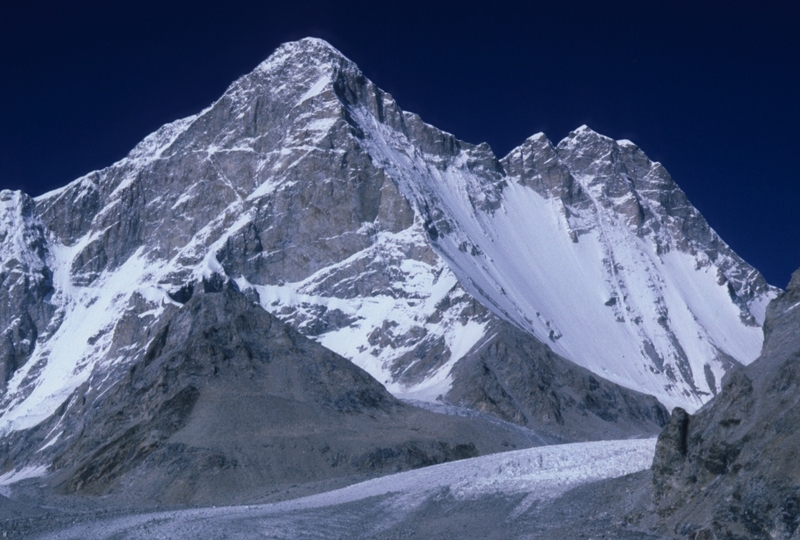 The significance of these men’s mountaineering achievement does not diminish with the passage of time. It was a technically difficult and objectively risky climb in 1951, and it is no less mortally dangerous today as the narrative of this Indian / German team’s failed attempt on the summit in 2014 learned, sadly, at their significant cost. The First New Zealand Himalayan Expedition, in 1951, was initiated by Earle Riddiford, who with Ed Cotter and Pasang Dawa Lama made the first ascent of Mukut Parbat, their target peak in the Garhwal Himalaya. Accompanying them on that expedition, though not to that summit, were two other New Zealand climbers, Edmund Hillary and George Lowe. Hearing of the success on Mukut Parbat, the New Zealand Alpine Club suggested to the Alpine Club in London that acclimatised New Zealanders would be a valuable asset on the forthcoming 1951 British Reconnaissance of Mt Everest, to be led by Eric Shipton. This resulted in an invitation for two New Zealanders to join the party: thrilling news the four climbers received while they were ensconced in the hill-country village of Ranikhet. A day and a half of bitter dispute rent the party asunder. Which two should go to Everest? In this enthralling narrative, journalist Lyn McKinnon tells the stories of Earle Riddiford and Ed Cotter, two extraordinary New Zealanders whose climbing achievements were forever eclipsed by the exploits of others. She draws on private papers as well as published work, and extensively interviews Cotter himself, and the families of both men, as well as many other contemporary climbers, to set the record straight.